Your vehicle’s belts and hoses play a critical role in the proper operation of your cooling system, air conditioning system, charging system and more. Old hoses can become cracked and dry rotted, causing them to squeal or break. Radiator and heater hoses will deteriorate with age and can get hard and crack or become soft and porous leading to system leakage and severe engine problems like overheating. A broken belt can lead to loss of power steering, failure to charge, or engine overheating, leaving you stranded on the road. It's important to have these components checked at least annually and replaced when needed. The typical life span of a belt or hose is seldom over 5 years. 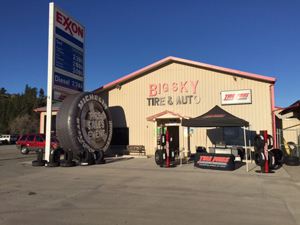 Your friends at Big Sky Tire Pros can inspect your belts and hoses and tell you if they are in need of replacement.